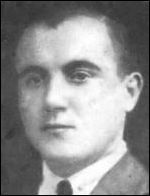 Parchomenko, Paul [Павло Пархоменко] – pharmacologist; born on 10 January 1895 in the village of Hrebeni (Kaharlyk raion, Kyiv oblast, Ukraine; at that time – Kyiv county, Kyiv gubernia, Russian empire); died on 17 January 1969, probably in Surrey, England, United Kingdom; buried in Streatham, London. After moving to Czechoslovakia, in the 1920s Parchomenko studied at the Ukrainian Free University (UFU) in Prague, where he was awarded a doctoral degree in May 1929. He worked in a pharmaceutical factory in Kolín, and subsequently at the Czechoslovak State Radiological Institute in Prague, where he invented a radiotherapy technique and associated equipment for use in the treatment of certain diseases. He also created many medicinal drugs which went into production in Czechoslovak pharmaceutical laboratories. In 1939-1945 he was a reader (docent) in pharmaceutical chemistry at the Ukrainian Free University. After the Second World War Parchomenko moved to the United Kingdom where he worked in the pharmaceutical industry until 1963. From August 1950 until January 1951 he was treasurer of the interim General Board of the Ukrainian Autocephalous Orthodox Church in Great Britain. His publications include a co-authored booklet on Radium and its uses in medicine – Concise information with special reference to miсro-radiation (c.1930), and articles in the journals Collection of Czechoslovak Chemical Communications (1938), Pharmazeutische Zentralhalle für Deutschland (1940, 1941) and Naukovyi zbirnyk Ukrainskoho Vilnoho Universytetu v Prazi (1942).